Geneva airport is a major European hub with direct links on 40 different carriers. The airport features a business center, world class shopping and top flight arrival services including a range of transportation options. Connection from airport to city is very convenient. Geneva is easily conquered on foot but there are a number of transportation options when you need it. You can rent a car upon arrival to the airport or in the downtown, order a taxi or simply use hotel shuttles. There are many parking options: at the hotels, at the airport, in several parking lots. During the rush hours (mornings and evenings), traffic jams might occur. Public Transport: The local bus and tram system covers virtually every square meter of the city and is highly efficient. Tickets can be bought at the machines next to most stops or at newspaper stands. Prices vary according to the number of zones crossed and duration of validity. Be aware that ticket machines take only coins and do not give change. Tickets are checked randomly by roving controllers commonly known as the “Green Jackets.” Click here to Plan route by public transport in Geneva. Lake Boats: Part of the local TPG system includes ferry shuttles connecting the right and left banks of the city. The service operates year round during daylight hours and is a cheap way to see the city from a new perspective. Departures every 10-30 minutes. CHF 2.00 for adults. Intercity Bus: The central bus station, Gare Routiere, located at Place Dorciere is the primary departure point for destinations within and outside of Switzerland. See Gare Routiere departures for a full list of destinations and schedules. Gare Routiere is also the meeting point for many guided excursions including city bus tours, day trips to nearby towns, and round trip ski bus tours. www.keytours.ch is the primary tour operator in the city. Bicycles: Free bicycles are available with deposit behind Gare Cornavin and at Quai du Mont-Blanc near the Bains des Paquis. Mostly flat city area and abundance of bike paths in the city are incentive for most cyclists as well as the paths along the lake which are truly beautiful. 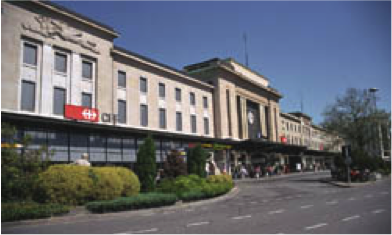 Train: The central train station, Gare Cornavin is a beehive of activity with rail links to the airport and just about anywhere else you can think of. New arrivals should beware of pickpockets in and around the station. The suburban Eaux-Vives train station on the outskirts of the city is since 2011 under the reconstruction and will be reopened in 2019. Gare de Lancy-Pont-Rouge is destined to become important station in a future, as a southern gare to Geneva. Check Journey Planner for destinations and timetables. You can book a luxurious limo or SUV of Your choice with chauffeur at Your disposal to transfer You conveniently to any given destination. Bern is situated in the heart of Europe and at the center of Switzerland. Whether by train, car or plane, Bern is easy to reach from anywhere. Bern is connected to the European route 4 (E4) and the national autobahn network. The city is also connected to southern Switzerland and Italy via the Lötschberg Tunnel / Simplon Tunnel and the Great St. Bernhard Tunnel. The international Bern Airport lies just outside the capital city and offers daily connections to various European cities. Just 20 minutes (10 km) from the city center, the airport has a reasonable size that facilitates the speedy processing of departures and arrivals. It is advisable to have luggage transported directly to and from the main railway station in Bern. Further information about "Fly Rail Baggage" at +41 (0)51 220 23 74. The city center can be reached easily and inexpensively within 20 minutes by public transportation. The AirportBus 334 runs half-hourly between the airport and the S-Bahn station Belp with direct S-Bahn connection to the main railway station in Bern. For the first flight in the morning at 06:00h there is a direct bus connection from Bern main railway station (05:10h Bernmobil platform L, station square) to Bern Airport. Bern is an important transportation hub within Switzerland. Regular direct connections by train to all major cities in Switzerland and to Europe's most significant megacities ensure a comfortable trip. The Swiss Travel System brings together all of Switzerland's public transportation options in the Swiss Pass and Swiss Flexi Pass – reasonably priced tickets for trips within Switzerland combining travel by train, bus and boat. People residing outside of Switzerland: Will your trip through Switzerland last a few days or even an entire month? Also, our Tourist Information office is located right in Bern's main station. Travel for free in Bern from June 1, 2014! The Bern Ticket is a great deal for visitors staying in Bern. If you're staying at least one night in tourist accommodation in the city of Bern you'll receive this complimentary ticket, which lets you travel for free on public transport in zones 100/101 operated by the Libero Association. The ticket also includes the popular Marzilibähnli and Gurtenbahn funicular railways, as well as transfers to and from Bern Airport. The Bern Ticket is valid throughout your entire stay in Bern. When you arrive, the confirmation of your hotel or boarding house reservation guarantees you a free public transport transfer from the train station or Bern-Belp Airport to your accommodation. The day card of Bernmobil gives you access to all forms of public transportation throughout the city of Bern. Basel Airport is located some 3.7 miles / 7 km northwest of Basel city centre. The airport also serves the city of Mulhouse, which is located 14 miles / 22 km away and the historic city of Freiburg, which is located some 43 miles / 70 km across the border in Germany. Although the airport actually sits on French territory, it is jointly operated by Switzerland and France. Its IATA code can be either BSL for Basel in Switzerland or MLH for Mulhouse in France, as well as the occasional EAP for Euro Airport, which is the international code. Basel Airport is well connected to roads and public transport. The A35 (on the French side) motorway links up with the airport and Switzerland’s bus service Line 50 to Basel connects the Swiss part of the airport with the main train station (Bahnhof SBB) in Basel. The French bus service Line 11 links the French part with the Saint-Louis train station. It takes around 5 minutes to get to Saint-Louis on the French side and 30 minutes to reach Mulhouse by car. A drive to Colmar will take around 50 minutes. Driving to Basel will only take 5 minutes and a trip by hire car to Berne will take approximately one hour, as will a car journey to Zürich or Lucerne. Euro Airport Basel-Mulhouse-Freiburg serves both domestic and international airlines. Flights top Munich, Frankfurt, Manchester, London, Barcelona, Madrid, Rome, Istanbul or Copenhagen for example leave at regular intervals throughout the day. International airlines such as EasyJet, British Airways, Lufthansa, Air France, Swiss Air, Air Algerie, Air Berlin and Austrian Airlines among others serve Basel Airport. The airport has only one terminal building. The information desk is located on level 2 and is open from 5.30 am to midnight every day. There are restaurants on level 5 in the Swiss Sector, which are open from Monday to Sunday from 08.00 to 23.00 and also in the French sector, which are open for business from Monday to Thursday from 09.00 to 23.00 and from Friday to Sunday from 08.00 to 23.00. For further information about services and facilities at the airport, please visit the official website at www.euroairport.com. You can see below a selection of nonstop flights covered from Basel Airport with approximate times.